Investigative journalist Andrea Kellner never lets anything get between her and her next scoop. So when a grief-stricken man crashes a charity gala and demands answers for his daughter’s death, Andrea knows it’s her duty to investigate. But she never expected him to point the blame—and his gun—at her date and his energy drink empire. When Andrea’s sister falls ill after ingesting the same exact beverage, her case gets even more personal. To uncover the truth behind the contamination, the journalist must confront the man she thought she knew and corporate execs with hush money to spare. With her sister’s life in peril, Andrea will stop at nothing to break the story before the death toll rises. 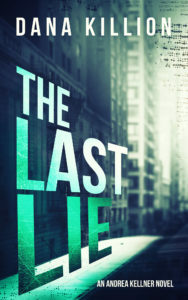 The Last Lie is the thrilling second novel in the Andrea Kellner crime fiction series. If you like complex plots, smart crime-solving women, and twists you won’t see coming, then you’ll love Dana Killion’s page-turning story. A journalist. A sniper. A city on edge. As investigative journalist Andrea Kellner is heading out of Chicago for a long weekend, a driver in front of her is shot and killed. The city’s gang violence problems have spilled onto a major expressway for the third time in a month. Or is something else at play? Her career faltering and marriage all but over, Andrea desperately needs a win, provided she can find out what’s really behind the shootings. With a boss who wants her sitting on the sidelines—or back in his bed, a competitive co-worker who just wants her gone, and a detective blinded by his own past, Andrea must look past CPD’s explanation and discover the truth behind the shootings. Provided she can live to tell the story. 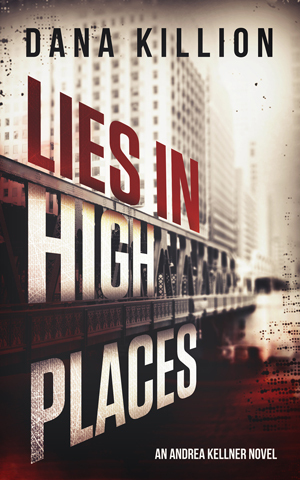 Lies in High Places is the first book in the Andrea Kellner crime fiction series.